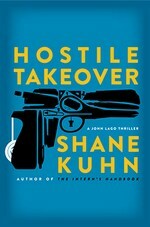 On the one hand, I’m annoyed that something about Bellamy Vale, our P. I. protagonist, is revealed in the book blurb for Hostile Takeover. On the other hand, I don’t know how I could’ve written much without slipping myself (but I appreciated the reveal when I got to it, having forgotten everything I read about the book before starting it). Bell works for Lady McDeath, the daughter of Hades. We’re not given many details of the arrangement (which I honestly enjoy — something I’ll get back to in a minute), but it involves her saying “Jump” and him leaping. Being her emissary on Earth comes with some real benefits — namely, he survives things, events, situations that he shouldn’t. Which is a real plus for a P. I. who annoys mobsters and supernatural beings on a regular basis. In this particular case, Lady McDeath wants Bell to investigate a couple of deaths that have been officially attributed to a wolf, but it takes Bell a few seconds to realize weren’t caused by anything from this world. The detective in charge of the investigation (naturally) isn’t wild about P. I.s in general, but has a special kind of distaste for Bell. This makes anything Bell does near the scenes, bodies, or anything else a sticky situation. Stickier yet, things that could do what was done to those bodies aren’t supposed to be in our world. While dying is off the table for Bell, he’s not impervious to pain or injury, and the state of those bodies suggests that there’s a lot of pain and injury waiting for anyone who gets between the creature and his/her/its next victim. To help him along the way, Bell calls upon a hacker friend, Zian, who is not entirely human; a nosy, ambitious, and fierce reporter; a police detective that he’s in an on-again/off-again relationship with (currently, it’s an off); and a few other local contacts/friends who are aware that not everything is as mundane as most people think it is. Overall, this was an entertaining cast of characters — I think we need a little more to the police detective that can’t stand Bell, because right now, he’s too one-dimensional. But otherwise, this is a good group to start a series with, there’s not one of them I don’t want to see again. Bell himself is pretty much your typical P. I. character — a loner with a tragic past, dedicated to the work he does, willing to take risks for himself (particularly since he knows no mistake is fatal) — but not willing to put others in the line of fire, he has a hero complex for sure. He’s got a decent sense of humor, a good moral code, and a loyal strike obvious to everyone. The added abilities that come from his supernatural patron are pretty neat and I don’t think I’ve seen much like it before. You can tell that Comby has worked out a lot of behind the scenes stuff she hasn’t shared with us — exactly what drove Bell to make a deal with Lady McDeath (we get hints, and they aren’t pleasant), what he had to do in order to seal the deal, exactly what deities are active in the world (or what pantheons are), what’s the source of the rules governing interaction between the worlds, etc. Comby had to feel a lot of pressure to spill those beans and she resisted — giving us just enough to ground ourselves in this world, but not boring the reader by drowning him in world-building (also giving her time and room to work out some details to make later books easier to pull off). Recently, I’ve complained about fantasy novels withholding too much world-building so that it’s too confusing for the reader to understand what they’re reading. Comby avoided both extremes and therefore succeeded in giving us a world that intrigues, and makes you want to know more about, without feeling utterly stranded. I had a quibble or two with the book, nothing major. I do think that the motivation for the Big Bad was too sketchy, and the reveal of their identity was tipped far too soon. Bell was just handed a lot of information without having to pound the pavement too much, which isn’t something that really commends a P. I. to me. But only guessing the identity of the Big Bad far too early bugged me while I was reading it — it’s only when I stopped to reflect on the book as a whole that the rest occurred to me. In the moment, the momentum of the storytelling and the strong voice kept me going. Also, I liked the characters enough that I was (and am) more than willing to overlook a few hiccups. This is a solidly built and solidly entertaining entry to this series — there’s a lot she can do with Bell and the others (depending which others come along), and it’s a world that would be easy to drop new/different deities/monsters/creatures into. The characters are well-developed and the kind that you want to spend more time with so you can see them develop more — I could just watch Zian (and his dad) talk to Bell for a bit and have a good ol’ time, too. I’m definitely interested in more from this series, and I bet most UF readers who give this a chance will be waiting for book two with me. Disclaimer: I received a copy of this novel in exchange for my honest opinion, the only impact that transaction had on my opinion was providing me something upon which to opine. John Lago is back, folks — and he picks up right where he left off, with some of the most adrenaline and testosterone-fueled writing you’ll come across this year. That may not be your cup of tea. 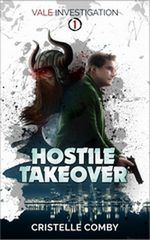 Hostile Takeover is one of those sequels I didn’t think needed to exist. Seriously, who was dissatisfied with where things ended up for Lago? It was narratively sufficient as it was — but as the opening lines of this book could’ve literally been the next page in The Intern’s Handbook, it’s hard to complain. So, John decides to tie up two loose ends: 1. Alice and 2. HR, Inc. He marries Alice and the two take over HR but it doesn’t take too long (at least not many pages) before both of those go wrong — they break up and she kicks him out of the company (not really spoiler material, folks, it’s in the Jacket Copy). John switches to Plan B, the complete destruction of both. Which is not the most mature of plans, you’ve got to admit. Which is the bulk of the book — John going undercover again, John trying (and/or being the target of) elaborate assassination schemes, great fight scenes and enough munitions used to make Michael Bay choke. All delivered in that movie-obsessed, rapid-fire (no pun intended) narration that won over so many fans before. I thoroughly enjoyed, have used already, and will continue to do so, Lago’s comments on the movie Fletch. It was that line that reminded me how much I liked the first book. Did I enjoy this as much as The Intern’s Handbook? Nope. Only because it didn’t blow me away with it’s freshness. But it’s a worthy sequel, as good as it’s predecessor and leaves me wanting more. An intense, fast read — buckle up and enjoy the ride.